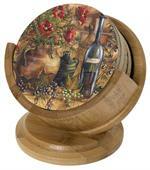 We have a wide variety of coaster holders for the line of Thirstystone Coasters that we carry. These coaster holders will hold 4 - 4" round Thirstystone sandstone beberage coasters. Any brand and type of beverage coaster will fit in this holder as long as they are no greater than 4" in diameter and are round. Beautifully functional in elegant and fun designs. They are made of metal and/or a variety of woods. Please browse through our selection of coaster holders and if you do not see what you are looking for call us at (520) 457-3335 during our normal business hours and we will be glad to help you. We carry a wide selection of collectables, old west memorabilia, gifts and jewelry in our store located at 504 Allen Street in Tombstone, Arizona. 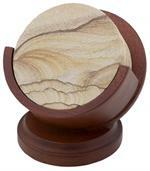 Cherry pedestal coaster holder for 4" Thirstystone round sandstone coasters. Any 4" round coaster will fit in this coaster holder. Kokopelli metal coaster holder for 4" Thirstystone round sandstone coasters. Any 4" round coaster will fit in this coaster holder. Black Ram wrought coaster holder for 4" Thirstystone round sandstone coasters. Any 4" round coaster will fit in this coaster holder. Brown Ram wrought coaster holder for 4" Thirstystone round sandstone coasters. Any 4" round coaster will fit in this coaster holder. Dark Roast Western Star coaster holder for 4" Thirstystone round sandstone coasters. Any 4" round coaster will fit in this coaster holder.